During the challenge, I'll give you a weekly grocery shopping list of specific ingredients needed to make the two featured recipes. Still, it can be helpful to have a general idea of the kinds of things you should have stocked in your fridge and cabinets. At least, that's what one past participant told me so I figured maybe more folks would like this too. Perhaps having on hand the foods listed here will inspire creativity and cause you to cook soup without a recipe, but just based on what calls to you. That's always fun! Your favorite bouillon, broth, or stock: I love Organic Better than Bouillon vegetable soup base because like bullion cubes it's economical and takes up less space in the fridge/cabinet, but it is 100x more flavorful than those cubes. If you prefer something more DIY and less processed, learn how to make vegetable broth with kitchen scraps at Oh My Veggies! vegetable oil: I use extra virgin olive oil, canola, and extra virgin coconut oil. diced tomatoes (Tetra pak or canned): fire roasted is tastiest. whole wheat pasta: bite-sized types like macaroni or shells is best. What do you prefer: homemade broth, bouillon cubes, Tetra pak broth, or Better than Bouillon? Leave a comment. 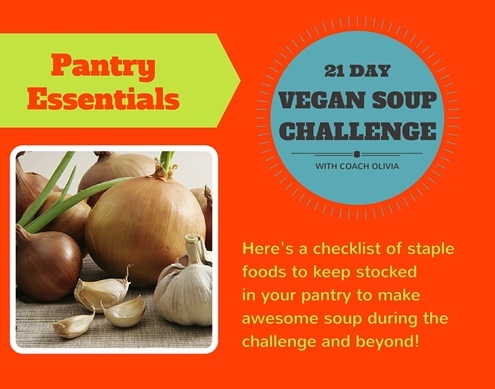 Are you participating in the Vegan Soup Challenge this February? Get all the info here.